We've all done it — suddenly bit the inside of our mouth while chewing food. 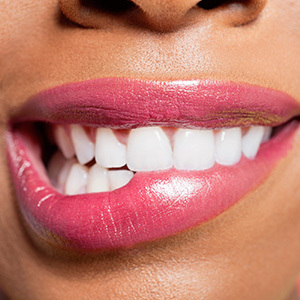 All too often our cheek, lip or tongue finds itself in the way of our teeth. The small wound caused by these types of bites usually heals quickly. But it's also common for the natural swelling of these wounds to cause the skin to become prominent and thus more in the way when we eat. As a result we bite it again — and again. If bit a number of times, the old wound can form a bump made of tougher tissue. Also known as a traumatic fibroma, this growth is made up of a protein called collagen that forms into strands of fibers, similar to scar tissue or a callous. As you continue to bite it, the fibers form a knot of tissue that becomes larger with each subsequent bite and re-healing. Unlike malignant lesions that form relatively quickly, these types of lumps and bumps usually take time to form.Â They're not injurious to health, but they can be irritating and painful when you re-bite them. We can alleviate this aggravation, though, by simply removing them. The procedure, requiring the skills of an oral surgeon, periodontist or a general dentist with surgical training, begins with numbing the area with a local anesthetic. The fibroma is then removed and the area closed with two or three small stitches. With the fibroma gone, the tissue surface once again becomes flat and smooth; it should only take a few days to a week to completely heal with mild pain medication like ibuprofen to control any discomfort. Once removed, we would have the excised tissue biopsied for any malignant cells. This is nothing to cause concern: while the fibroma is more than likely harmless, it's standard procedure to biopsy any excised tissue. The big benefit is that the aggravating lump or bump that's been causing all the trouble is no more. You'll be able to carry on normal mouth function without worrying about biting it again.